The Hannibal Central School District Strategic Plan Committee, comprised of community members, business owners, parents, students and faculty, continues to make strides to create a plan for the district’s future. Led by outside education expert Penny Ciaburri and Hannibal school administrators, the committee has met three times since October to talk about goals, concerns and ideas to make the Hannibal school system a “destination district” for those seeking a premiere learning environment. Members of the Hannibal Central School District’s Strategic Plan Committee discuss their vision for the district’s future during a meeting earlier this school year. Outside education expert Penny Ciaburri (right) reviews the group’s work, which will continue periodically throughout the year, culminating with an April 9 presentation to the school board. 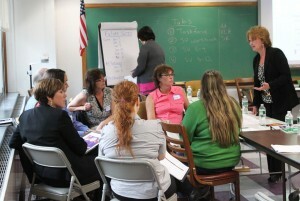 The ideas are recorded and discussed as potential components of the district’s five-year plan. “It’s a very thoughtful and reflective process that will help put in place a blueprint so that five years from now we’re telling the Hannibal story,” Ciaburri said. While the initial meeting in October served as an introductory gathering where committee members met one another and began outlining the foundation for their work, the Nov. 7 meeting provided more in-depth conversation with administrators. Kenney Middle Principal Dee Froio, Fairley Elementary Principal Jody Musa and the district’s internal facilitator Tammy Farrell reported on efforts currently underway to help transform Hannibal schools. According to the administrators, teachers are engaging in job-embedded and traditional methods of professional development aimed at developing a curriculum that meets Common Core Learning Standards. “(These efforts will) foster growth in research-based best practices aligned to Common Core shifts in English and mathematics,” a district official said. Such efforts include teachers working with Cheryl Dobbertin, author of “Common Core Unit by Unit”; consulting with literacy specialist Auddie Mastroleo to implement the third through eighth-grade English modules; collaborating with a data expert and receiving training on the use of data to drive instruction; attending literacy and math networks at Oswego County BOCES; and building leadership teams to help create school comprehensive improvement plans. In addition to the administrators’ report, Superintendent Donna Fountain brought the committee up to speed on the board of education’s efforts to strengthen the district. According to Fountain, board members attended an outside retreat to assess the current condition of the district and develop goals to lead the transformation efforts. Committee members also evaluated data collected from a student survey and worked in groups to identify strengths, concerns and surprises indicated by the survey responses. While the core team continues to develop a mission, vision and beliefs for the district’s future, three separate task forces are also meeting to solidify a five-year blueprint by focusing on student engagement, family/community engagement and academic achievement. The task forces are comprised of core team committee members and additional members of the community. The next core team meeting will be held from 4-6:15 p.m. Jan. 9 in the Hannibal Central School District boardroom. The following week, from 4-6:15 p.m. Jan. 16, the core team and the three task forces will meet. The core team will present a final plan to the school board during a meeting April 9. For more information on the process or to become involved, contact Farrell at [email protected] or by phone at 564-7900, ext. 3004.